I just found out about this very interesting project – The Great War on YouTube. Their plan is to do at least one episode a week all the way through to November 2018, covering the Great War in “real time”, as well as extra episodes for background material and answering questions from viewers. Each episode is short (five-ten minutes) and focuses on either the week it’s covering or a specific topic. I’ve got their chronological playlist running (see the first set of links on their Youtube homepage) and it’s good solid stuff, starting with a great attempt to explain the insanely tangled mess that lead to the start of the war. I’ll be subscribing and following this one with interest, especially if they manage to keep running through the entire four-and-a-half run of the war. The host is historian Indiana Neidel (excellent pulpy name, too) who is an interesting and engaging host. The Atlantic magazine is running a ten-part World War One in Photos series with some very interesting images I’ve not seen before. They’re doing a post every Sunday for ten weeks. The most recent post, WW1 in Photos: Technology has some great photos of obvious interest to wargamers, although the whole series so far is very high quality and has a great selection of photos. The often-fascinating website BibliOdyssey has just posted a glorious selection of World War One posters from the US, UK, France, Greece and elsewhere. 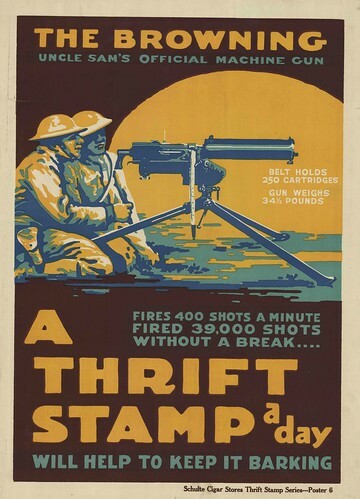 I’m hard-pressed to pick a favourite, but purely for graphical awesomeness and a slightly surreal message, it might be this American poster telling people to fund a hungry machine gun. Feed a machine-gun – the Great War equivalent of those “Feed a child” ads we see today, I guess? BibliOdyssey is also over on Flickr, too. Merry Christmas, Happy Holidays, Squamous Cthulhumas, or whatever other mid-winter holiday you celebrate! Here’s a bit of family Christmas history to share. I might well have shown this off here on the the Warbard in the past, but I’m half-full of eggnog and can’t be arsed to search my own blog again on this Christmas Eve. 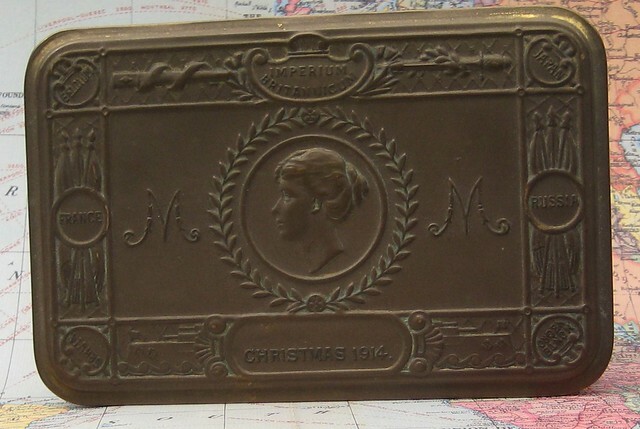 A relative’s World War One Princess Mary’s gift tin from Christmas 1914. A South African relative was on the Western Front in France from Autumn 1914 onward, arriving as part of the first South African infantry contingent sent to France. These tins were the brainchild of the then-teenage Princess Mary, and sent out by the thousands to troops in France. James Elliot van der Reit was killed in action in April 1918, having survived nearly the whole of the Great War. The tin must been returned to his family in South Africa, and was passed on to me a few years ago as part of the cleanup of my late grandmother’s house. You can see more notes and a larger version of the photo if you click on the photo and go to my Flickr account. I was reminded of my tin (which usually lives tucked under my computer monitor) by a BBC News story about the tin boxes of gifts still sent to British troops; these Princess Mary tins were the first of what has become a standing tradition for the British military. Over a year ago, in July 2011, I wrote a long article called Great War Resources with links to the Internet Archive and other places you could find resources of interest to Great War/World War One wargaming. Here’s a bit of a long-delayed followup, the result of an evening wandering the (virtual) aisles of the US Army’s Combined Arms Research Library (CARL) website. My original post mostly had material from the Internet Archives and just a bit from CARL, as I’d only just discovered that resource. CARL material is biased toward the last two years of the Great War, 1917 & 1918. Given that this is an American military library we’re using, it’s only natural it would have more material for the years when the Americans finally realized there was a war on and joined in. Also, there was a huge outpouring of studies and material from all the combatants as the war ground onward, and as I mentioned in my original article, on the Allied side lot of it was deliberately aimed at bringing the newly-arrived Americans up to speed as rapidly as possible in the harsh environment of the Western Front. To get the best PDF files quickly from a individual CARL listing, use the pale blue “Download” button on the far right of the page, opposite the title. That’ll get you a PDF with a human-readable filename, which is useful. Using the red-and-white PDF symbol gets you the same file, but with a random alphanumeric filename, kind of hard to keep track of once it lands on your own hard drive! The following links are a few from the CARL Obsolete Military Manuals collection I happen to have noticed that might be of interest. Notes on infantry attacks and raids as organized in the present war. US War Dept, 1917. Scouting and Patrolling, Army War College 1918. One easy way to sort through the Obsolete Military Manuals material is to sort by date of original publication. I can’t find a way to save links to specific searches (they time out) but use the Advanced Search dropdown on the top bar (beside the search box) and then use the Search By Date function at the bottom of that dropdown. There’s a few random bits and pieces in the 1914-1916 range, then a positive explosion of material from early 1917 onward. 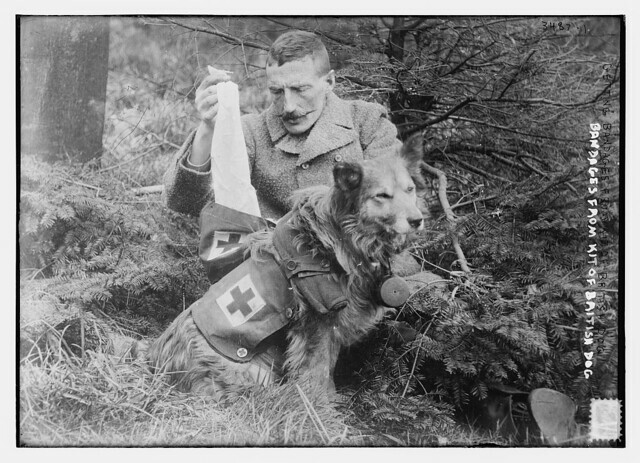 "Getting bandages from kit of British Dog (LOC)" via the US Library of Congress on Flickr. Click to go to the original Flickr page to see larger images. "The animal seeks for wounded men lost on the battle-field; he searches in holes, ruins, and excavations, and hunts over wooded places or coverts, where the wounded man might lie unnoticed by his comrades or the stretcher-bearer." That lead to some Google searching and the discovery of several interesting articles about military dogs on the Western Front, primarily as ambulance dogs or messenger dogs. There’s another LoC image on Flickr that has some very good links in a comment just below it, a few of which I’ve reproduced here. The fascinating Out of Battle blog has a pair of posts from 2008, one on messenger dogs and the other on ambulance and other uses of dogs, with some further links and resources. Over on the always-valuable Internet Archive there’s a 1920 book called British War Dogs, Their Training and Psychology, downloadable in the usual variety of formats, including PDF with the original illustrations and diagrams. I’m not (yet!) into Western Front Great War gaming, but if you wanted a unique unit amongst your trenches, a dog and handler could be done quite easily with a spare infantry figure and a dog — quite a number of manufacturers make dogs in both 15mm & 28mm. From the look of the period photos, most of the dogs were collie or terrier types, not very large, which makes sense. The ambulance packs could be sculpted with a bit of milliput or greenstuff, and a messenger collar would be even easier to add. Unleash the dogs of war! 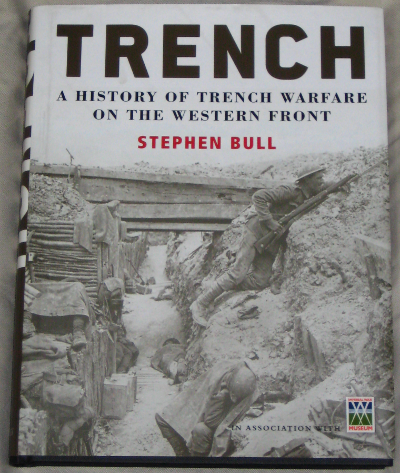 My most recent order from Naval & Military Press showed up this week; just over three weeks enroute isn’t bad for surface shipping from the UK to western Canada. This time I got Britmis: A Great Adventure of the War and The Great War on the Western Front: A Short History. Britmis is an NMP republication of Major Phelps Hodges’ memoir of his participation in the British military mission to Siberia during the Russian Civil War and subsequent escape through the Gobi Desert to China when the Russian Civil War started going very badly. It has the gloriously Edwardian sub-sub-title “Being an account of Allied intervention in Siberia and of an escape across the Gobi to Peking”, and in addition to being interested in the Russian Civil War generally, I’m a sucker for any book with sub-sub-titles or chapter sub-titles that start with “Being an account…”, so I expect Britmis to be a fun read. It’s a chunky little trade paperback, 365 pages or so and includes photographs taken by the author during his adventures. I read Beasts, Men and Gods in e-book a while ago, and Britmis looks to have a lot of the same flavour and interest! The Great War on the Western Front by Paddy Griffith is one of the standard modern texts on the Great War, “revisionist” in the best sense as Griffith works away at the old myths that the Western Front was nothing but pointless slaughter and stupidity. I won’t be getting to this one for a while, but NMP had it on sale at an absurd discount (their regular price is pretty good too, mind you!) so I couldn’t pass up the chance to add this one to my library. This should be worth watching: Curt of Analogue Hobbies is beginning a Great War in Greyscale project. Most figures in greyscale, officers in a very dramatic desaturated “chiaroscuro” colour scheme, and (hopefully!) greyscale terrain as well. There have been other greyscale wargaming projects out there (Curt links to a couple) and I’ve seen some very dramatic dioramas done that way, too. It’s been something I’ve considered off and on (it certainly fits with my usual pulp/interwar/WW1 focus) but have never done anything about. I’ll be watching Curt’s project with great interest! To round out this post, another tutorial posted on LAF, Elladan’s inspiring Making of a Teddybear-fur Mat, which is also posted over on his own website. If you’ve never seen Elladan’s website before, get over there and have a look around. All sorts of awesome stuff, and more fake-fur mat work over there too.